Since 1929, the MPWD has provided safe, high quality, and reliable water to its customers. We are pleased to report that in 2015 we once again met and surpassed all federal and state water quality regulations. Click here for the 2017 Consumer Confidence Report detailing the information. Your satisfaction is our top priority. Please contact us with any questions or concerns. Mid­-Peninsula Water District (MPWD) adopted and approved the 2015 Urban Water Management Plan and Water Shortage Contingency Plan at the regular Board meeting held on Thursday, June 23, 2016. The UWMP will be effective for five years through 2020. Both plans can be viewed in person at the District Office at 3 Dairy Lane, Belmont, CA 94002, or by downloading as PDFs below. 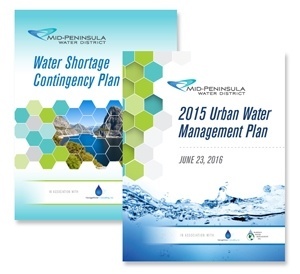 To download the adopted 2015 Urban Water Management Plan and Water Shortage Contingency Plan, click here. 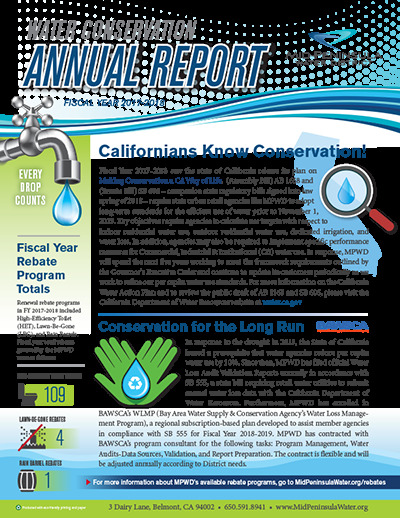 MPWD's Water Conservation Annual Report is a comprehensive accounting of MPWD's efforts during the statewide drought, including achievements, rebate programs, reporting on the State Water Resources Control Boards (SWRCB) and Bay Area Water Supply and Conservation Agency (BAWSCA), community outreach and education, and MPWD's own water conservation efforts. The Mid-Peninsula Water District (“MPWD”) is governed by the provisions of the California Water Code (“Water Code”) Section 30000 et seq. (and following) sections. Under the Water Code, the MPWD General Manager has authority to employ and discharge an employee at any time, with or without cause. 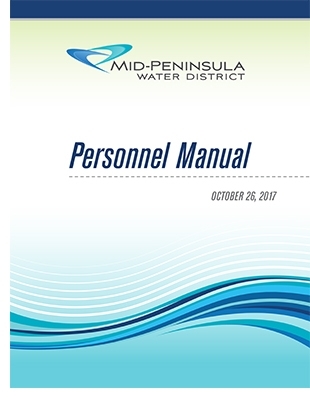 This manual replaces and supersedes all personnel manuals, revisions, and amendments previously adopted by the MPWD. MPWD levies an Existing Facilities Charge on new or expanded connections as a condition of development. This charge was established to recover the cost of capacity in District facilities benefitting new development. The current fee was adopted in 1993 and has not been updated in over 20 years. This report refers to this type of development impact fee as a “capacity charge,” in line with terminology used in California Government Code. New connections also pay a Meter Charge to recover the cost of the water meter and a Service Line Charge to pay for the District’s costs of installing the service line and making the physical connection to the water main. The study develops long‐term financial projections and calculates new water rates designed to equitably recover the costs of providing service. The recommended rates are designed to meet the District’s operational and capital funding needs, comply with legal requirements, and be fair to all customers. A summary of key issues (water consumption and MPWD finances) as part of the ongoing MPWD Financial Plan and Rate Study. 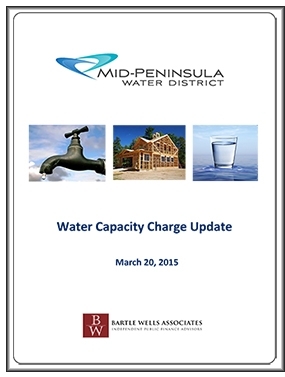 An Ordinance Amending Attachment A Regarding Rates and Charges to the Water Service Ordinance for The Mid-Peninsula Water District.